The word “real” is stretched a little bit this week when referring to “The Saddle Club” but to its fans, The Saddle Club is as real as any horse alive. Stevie, Carol and Lisa have become friends to many in their nearly 25 years. The original Saddle Club was a series of novels written by Bonnie Bryant in 1986. Bonnie was a horse lover that had spent little time with horses aside from her time at summer camp in upstate New York. The books vary a bit from the television show that most people are more familiar with in a few ways, the main being set in Willow Creek Virginia. The other main difference is the coat colors of the horses. Starlight was originally a dark bay with a star and Belle was also a bay. They are portrayed a bit differently in the show. The book series saw 101 novels and countless other spin-offs. The Saddle Club television show began airing in 2001 and after a hiatus of 5 years, returned in 2008 with a new cast and show! There have now been over 70 episodes shot and its still going strong. The television show is shot in Victoria Australia and features actors and actresses from Australia, although it does air all over the world. In the television show Stevie’s horse Belle is a chestnut and Carol’s horse Starlight is a bright buckskin. These are the two main difference in the show and the books. The show has also seen the begining of a successful music line performed by The Saddle Club girls! They even performed at Breyerfest! Some collectors will remember that Breyer created a The Saddle Club line of horses in the mid 1990’s, that was unfortunately discontinued by 1998, but in the past couple years we’ve seen the line return with new horses! The line features traditional horses featuring Prancer, Belle and Starlight, a classics line that also features horses with accessories, a plush line and stablemates! 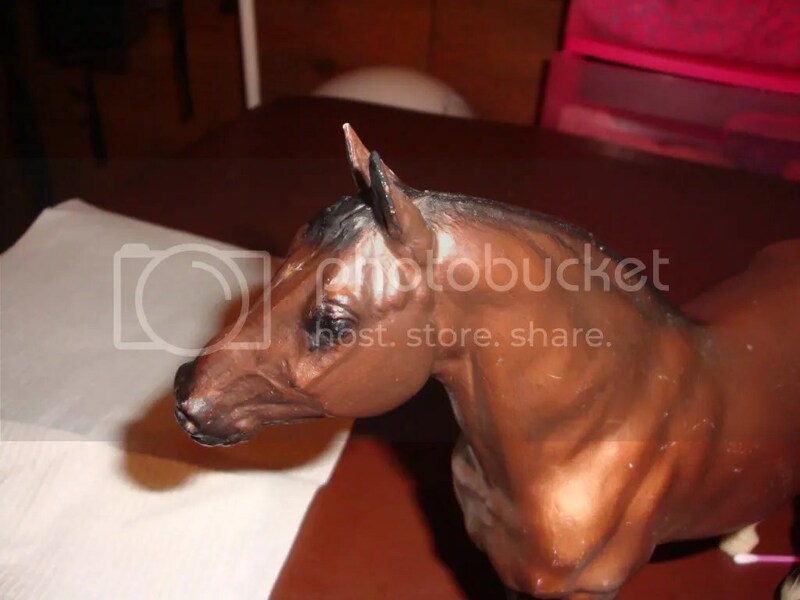 You can take a look at the entire line on GoldenOakStables.com which features tons of Saddle Club horses, dolls and accessories. The Saddle Club may have started as a book series that horse lovers from a generation past fell in love with but with both a television show and a new Breyer line, there are many young girls that are finding the series over 20 years later! I’m sure we’ll be seeing more of The Saddle Club for many years to come! We’re only about a month away from Golden Oak Stables‘ first all open NAN qualifying show and we’re filling up quickly! If you haven’t taken the time to enter now is the time. NEFL is the only live show in New Hampshire and has a full class list as well. The show features over 100 classes as well as double judging in the Halter classes, that means there will be nearly 500 NAN cards that are up for grabs and over 2000 ribbons! Not only are ribbons up for grabs but there will also be dozens of trophies and rosettes. The NAN cards are on their way, the trophies are here and the ribbons are on order! Our judges are exceptional! We are proud to be honored with talented and knowledgeable judges that have wealths of knowledge to share. Our judges range from having years of model horse experience, to years of real horse experience, and for our custom classes we have hobbiests that are experts in the field of art as well as horses. As always with Golden Oak Stables the focus will be on learning, and there is no doubt that our judges will teach us all many things! If this is your first show don’t worry! We have many first time showers as well as many experienced showers already. All ages and experience levels are welcome. Our show is NAN qualifying, which means that any horse earning a first or second will be qualified for the nationals show in July of 2010. The nationals show takes place in Kentucky the week of Breyerfest, so if you are headed to Breyerfest next year and have a few extra days, you might decide to take your winning horses to the national show. Who knows, you might just go home with a national champion, and all from just showing at NEFL! Information can be found at NAMHSA.org . Whether its your first show or your hundredth, this is a great show to attend. You won’t find a show with more “Breyer Only” classes as well as having classes for just about any performance entry you can think of! And don’t even think about leaving your customs at home, there are dozens of classes for them too! Mark your calendar and fill out your entry form, NEFL is coming up and filling quickly! Contact me for more information and for a special incentive for those of you that have attended a previous Golden Oak Stables’ show! Today we’ll take a little break from our regularly scheduled “How-To” to take a look at the fall releases for 2009. Not to worry, we’ll be back with the second half of last week’s “How-To” next week. Secretariat, one of the most famous race horses of all time was brought to us in the late summer/early fall of 2009 and has become wildly popular already. His dynamic position and wonderful story has created a place in collectors hearts already. 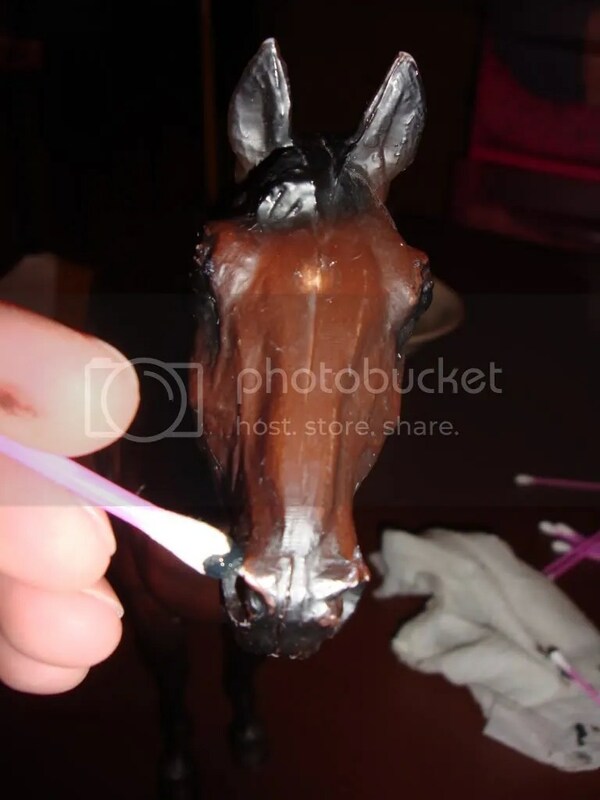 The Secretariat is done on the Smarty Jones model and is sculpted by Sue Carlton-Sifton. Water is the last in the Ethereal series released by Breyer over the past two years. Breyer first teased us with a glimpse of the Ethereal series in 2003 with a small photo in Just About Horses.This series that has been in the works for many years has finally come to a close with a beautiful finale. Water is done in a beautiful dappled blue roan. Water, as well as the rest of the Ethereal series is the epitome of quality and beauty in the Breyer series and is not to be ignored! Cloud: Challenge of the Stallions is the latest release that Breyer has done featuring the famous mustang stallion’s herd. The cloud series can be seen on PBS and a new special is airing on October 25th, be sure to check it out! The Challenge of the Stallions set features four classic size horses, the two adults are featured on molds sculpted by Chris Hess and the foals are two new sculptures that have been added to the Breyer line within the last year or so. Wild Blue and Little Prince are both new horses that feature stories to go with them. These new horses along with their novels are sure to become not only popular stories with horse lovers but classics for years to come. Both Wild Blue and Little Prince are classic scale and feature beautiful paint schemes. They both are also sculpted by Chris Hess. Last but certainly not least Breyer has added three new additions to its ever popular Stablemate line. The Stablemate tractor playset includes a longhorn, llama, horse, farmer, his tractor and more. A new fancy Stablemate trailer set was also released this fall in a pink and yellow color scheme. Lastly for the Stablemate line was a new ranch set, the Cherry Creek Ranch Set. 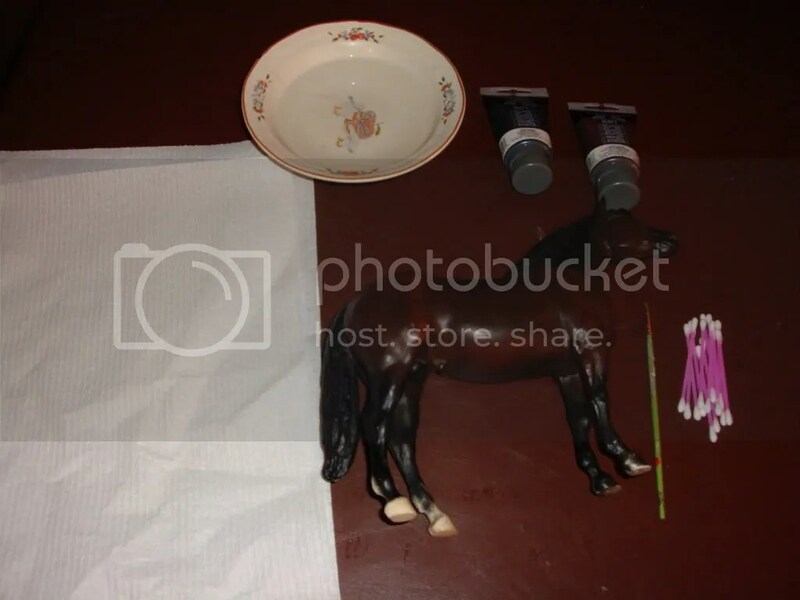 This set offers three horses, animals and accessories. Breyer has created so many interesting and dynamic models for the fall its hard to guess what they might have in store for the new year, only time will tell! 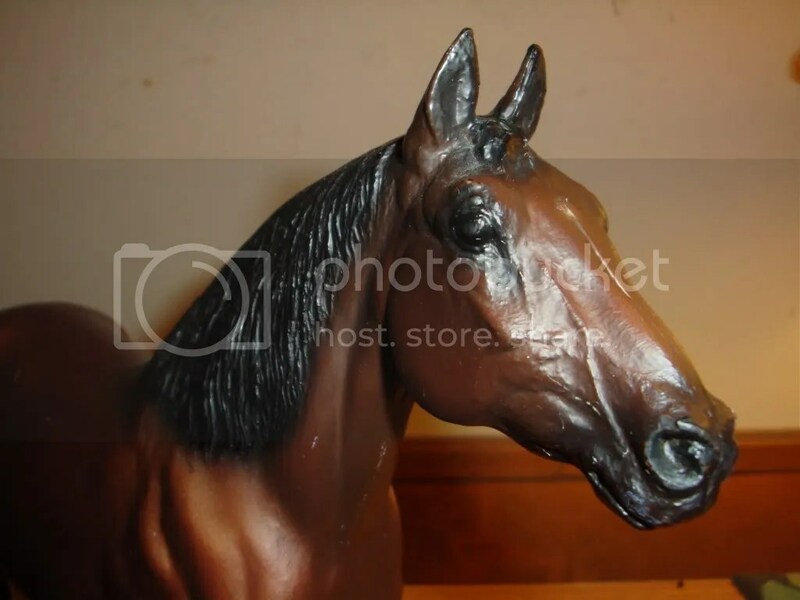 As always you can take a look at the entire Breyer line at Golden Oak Stables‘ website. Breyer is famous for creating champions in plastic 1/9th scale, and Thee Desperado is no exception. Not only is the real Thee Desperado a well deserving and amazing Egyptian Arabian, but his Breyer horse is also a favorite among collectors! This became clear at Golden Oak Stables’ workshop day when many participants were very excited to get their hands on one! Thee Desperado was born in 1989 he was thrust into a hard life early. As happens occasionally, his mother refused to nurse him and they called in experienced help. Shawn Crews from Arabians Limited was called in and she immediately saw him as a star seeing something different in him. Well, he didn’t disappoint! Thee is one of the most famous of the rare Egyptian Arabian line and holds the honor of being the top producing sire for that particular line of Arabians as well as a national champion many times over. His offspring live all over the world including the Crown Prince of Saudi Arabia. Desperado’s showing record speaks for itself, in 1993 he was honored with top ten placings at both the United States and Canadian Nationals. Then in 1994 he was named Region 9’s Grand Champion Stallion. Then at Scottsdale, one of the most famous Arabian horse shows, he was named Unanimous Grand Champion Stallion. Capping off a great year he ended with a win of the United States Reserve National Champion Stallion. Quite a way to burst onto the scene for a little “Runt” colt! After taking the show scene by storm he went on to stud. From 1996-2006 he was even named the Overall Leading Sire of the Egyptian Event. His foals have gone on to show and compete well and one even became a film star! Thee Cyclone, a son of Thee Desperado, was selected n the lead role for Disney’s IMAX representation of The Young Black Stallion! The model Thee Desperado is done on the Proud Arabian Stallion mold that was sculpted by Chris Hess and introduced in 1971. The Proud Arabian Stallion is a stylized version of an older style Egyptian Arabian, very appropriate for Thee Desperado. The Proud Arabian Stallion (Sometimes shortened by collectors to PAS) has been made in many colors over the years, but has never been given the honor of being such a famous stallion! He’s full of energy and pride and makes the perfect representation of Thee! Breyer produces many champions each year, but Thee Desperado is a champion that stands out among many, from his beauty to his offspring, he’s well on his way to becoming a horse that will live far beyond his years on earth. The Breyer Classic Models are some of the easiest to collect and sometimes the easiest to forget about. Breyer classic models are approximately 1:12th scale and about 6 inches tall. They are made of the same plastic as the traditional models and are hand detailed just like all Breyer models are. In recent years there have been new sculptures each year making many new models for collecting. In 1975 and 1976 Breyer commissioned the use of five Thoroughbred sculptures, three Arabian sculptures, three Quarter horse sculptures, and three Mustang sculptures from the Hagen Renaker company. The Hagen Renaker company was a porcelain figure producer that created mostly animals. They gained popularity in the 1950-60’s for their beauty, their horses were sculpted by Maureen Love Calvert who is often hailed as one of the most talented horse sculptors in Breyer’s line up making her models very collectible. The Arabian, Quarter Horse, and Mustang sculptures were all released as family sets. The Thoroughbreds were released induvidually as famous race horses along with one addition, Ruffian sculpted Chris Hess in 1977. 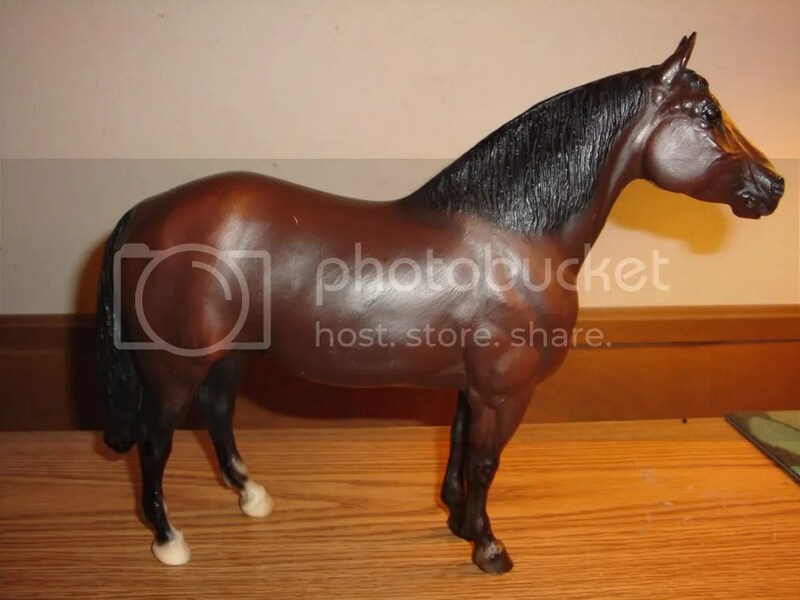 These models gained in popularity and new molds were introduced in the 80’s including an Andalusian family and famous book series horses including The Black Stallion and Black Beauty. These were sculpted by Chris Hess who sculpted many Breyer models. In 1992 Breyer introduced yet more Classic models. This time is was the Mesteno series. The Mesteno series was sculpted by Rowland Cheney and began a series of famous mustangs. Over the next five years Breyer released a new sculpture each year in the Mesteno series for all to collect. These models are fanciful and very artistic. The last installment for the classic series in the 1990’s was a series of famous western working horses sculpted by Carol Herden.These models are high energy and dynamic sculptures that are popular mounts for performance lover. The new millennium brought a whole new life for the classic models. 2002 brought a favorite for many, a Shire Sculpture created by the ever popular Kathleen Moody. Breyer then introduced a second set of Kathleen Moody’s sculptures into the line in 2006, the American Quarter Horses. This same year Breyer’s rights to the Hagen Renaker molds expired and we lost some of the most favorite classics. This has created some desirability for the models and they are becoming very popular. Breyer has continuted to release new sculputres into the classics line including a Morgan family and a Warmblood family. In 2008 they created the first series of haired models available through the Breyer line. Breyer’s classic models have become popular again and easy to collect. With variety and value they are an easy choice. Take a look at all the variety that the classics offer on GoldenOakStables.com. You might just find they not only allow more shelf space but they also are full of life and just a blast to collect! At some point we all end up with a model or two in our collection that might have been played with a bit and has some rubs and marks. This is very common for Breyer horses. Those of you that were at Golden Oak Stables’ workshop day in August may have seen me doing touch-ups on a few horses there. This is very simple to do with a little practice! For this project you’ll need. You’ll first want to clean your horse really well with water to get any dirt off, you want the cleanest canvas possible to start your project on. 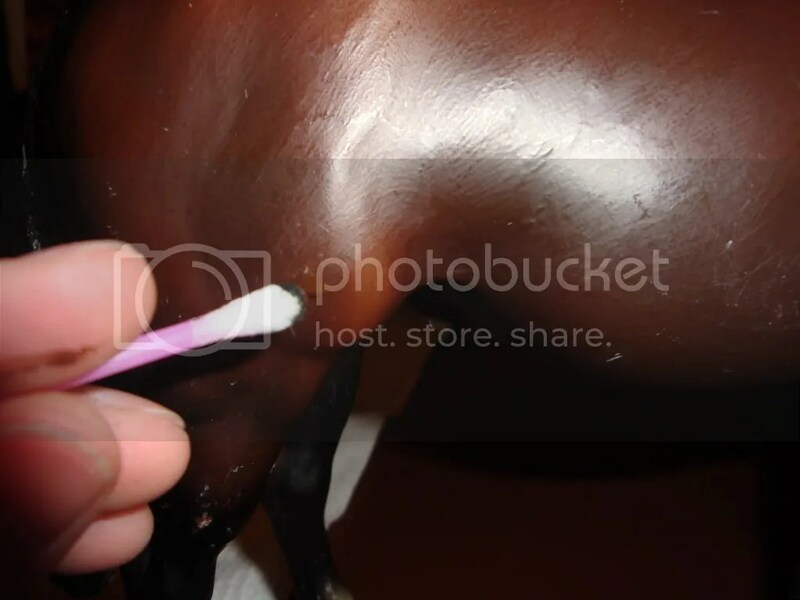 Once your horse is clean you can begin to work with the paint. For this dark bay horse I only used two colors, a medium/dark brown and a black. By using acrylic its completely washable if you should mess up. Mix a color that you think is closest to the color that your horse is. When you do have that color, start putting a light layer of paint down withe either your paintbrush or Q-tip. You’ll find one that works best, for this project Q-tips worked best for me. Your first layer might be too light, if you can see white still through the paint put down a second layer. Moving onto the ears and nostrils are some of the most common places for rubs to occur. On a dark bay horse these places will most likely be black. Using the black I began to put the color on the nostril as well as the ear tips lightly. Here you can see where the black on the eartips are. They still need to be blended in with a bit of brown on the opposite side so that it isn’t noticeable where you have painted the horse. Using the Q-tip blend these colors together so that the black line you see evens out. Once you’ve touched up the places that are needed let your horse dry completely. As you can see here, he’s almost done! The ear tips and nostrils look brand new, you can barely tell that they ever had rubs! 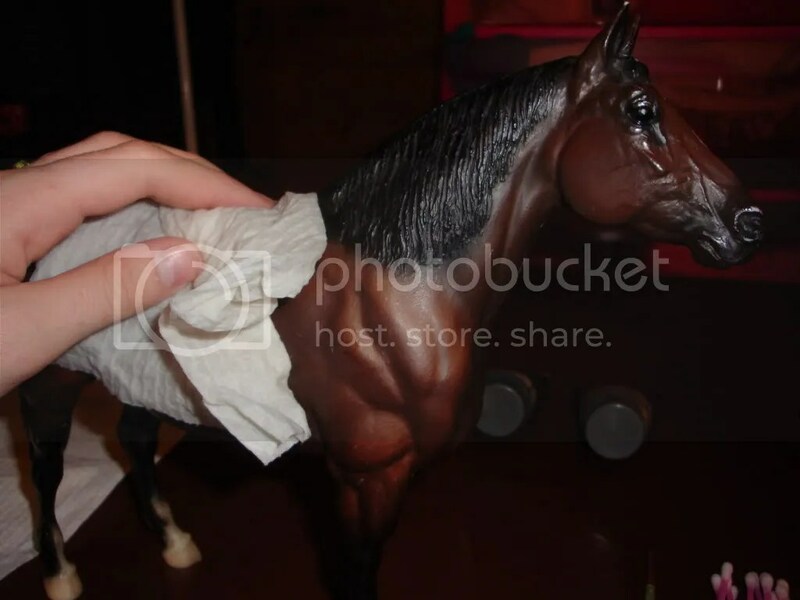 This example of a Breyer still has a few spots on him that need removed. These are white and black marks that are on top of the paint, not through the paint. These are very common too. Next week we’ll go over how to get those off and turn this guy into the handsome boy he once was! Water has arrived from Breyer Horses – Last in Ethereal Series. Pre-orders will be shipped no later than tomorrow. You are currently browsing the Stable News blog archives for September, 2009.